Our latest study reveals shocking findings about why medical errors continue at an alarming rate! For CLMA Members, Nursing Staff, Lab Managers, and Hospital Quality Improvement officers (only) Special Discount: At 30% discount (Regular Price: $42.75), $29.93 plus $6 for shipping. Click the button below to order online. Orders with check or money order can be sent to: Lara Publications, Book Order Dept. 12382 Trail Forest Lane, Florissant, Missouri 63033. This discount is good for only 30 days starting Dec 1, 2002. New Book: 101 Ways to Prevent Medical Errors by 'Yinka Vidal, BS. MA. H.ASCP. The concern of medical errors has attracted more of the media and public's attention since the Institute of Medicine's (IOM) report was released in late December 1999. The report indicated that 44,000 to 98,000 patients die annually due to preventable medical errors. Following this report there were Congressional hearings, and President Clinton released his directives about how to reduce medical errors using many government agencies. Congress also voted to spend millions of dollars for research on how to reduce errors in health care institutions. The Agency for Healthcare Research and Quality (AHRQ) received $50 million in 2001, which was distributed to various institutions for research on medical errors. Many organizations were created, and "medical errors" became the household word. However, despite all these efforts, medical errors continue. The changes being initiated in the health care systems appear not to be effective in reducing medical errors. This research started almost 24 years ago as an observational study to find out what was happening in hospitals that was causing patients to die. Since then, we went through different levels of this project and uncovered shocking information. This ongoing study is also being engineered to help solve the mystery behind the continuation of errors. Contrary to the general notion of looking at "systemic problems" and doing "root cause analysis," this study uncovered critical information for the first time on why medical errors continue to happen at an alarming rate. The initiative to blame systemic problems was designed to look at the root causes of problems and work to fix them. This should be differentiated from the old way of blaming people, especially when such situations are beyond workers' control. Sadly, people might have overused "systemic problems" by hiding more serious problems without realizing it. Since the study continues over a long period of time, the present phase reveals that systemic problems are just the symptoms of other major problems. The best way to introduce this revelation is to use the medical model. When a patient is sick, the physician has to do a differential diagnosis using all the technological advancements in medicine within his reach. Just because he is working to find the cause of the illness does not guarantee a cure. To achieve the objective of healing a patient, treatment strategies must be applied and monitored for effectiveness. Similarly with medical errors, the systemic problems are just symptoms of the disease and perhaps the catalyst uncovering more serious problems. To affect cure, corrective action must be implemented. These factors were shocking because they were unexpected influences on the outcome of our project. The study was operating under the false assumption that everybody wants to solve the problems of medical errors. This was not true, because not everybody discussing the problems was actively willing to do something about it. At this stage of the study, we were not interested in negative factors, so they were ignored. We were only interested in finding what works to solve medical errors, and we uncovered many good strategies. These are discussed in Chapter Seven. All along the way, the study had been affected by these negative factors, but we paid more attention to positive factors until we experienced an active resistance from a Chicago lab director. That experience opened our eyes, and we carefully went back and looked at factors of great deterrence to solving medical errors. The book 101 Ways to Prevent Medical Errors, published by Lara Publications, is based on the results of 24 years of observational study in various hospitals across the nation. The first phase covers a limited number of hospitals, but it nonetheless yields very valuable information with national implications. The second phase of the study (including second and third part) is currently in progress yielding valuable information about what is causing resistance to correct medical errors, as mentioned above. This book outlines over 100 systemic problems looking at laboratory results and operations, nursing errors and systemic problems, stages of medication errors, physicians' roles in medical errors and the crucial roles of the hospital administration to improve the quality of care. In addition to health care issues, the book is designed as a problem solving intervention for any business. It explores the relationship between managers and employees, and teaches how workers can be motivated to do their best while in pursuit of excellence. In addition to identifying technical problems, this report also uncovers the crucial role human behavior plays. Motivation, anger, frustration, depression and anxiety are direct causes of errors on the job. Most professionals usually do not look at the human factor as a causality of errors. This study uncovers that the continuation of medical errors is sustained largely by human resistance to change. However, such resistance to change is not unique to health care workers. As a result, it is important to look at those human factors creating problems on the job for workers. Some chapters of the book, therefore deal with topics such as: how systemic problems affect medical errors, history of management problems in hospitals, what hospitals can do to solve these problems, stress as a direct cause of errors, increased workload leading to increased errors and the effects of stress and stress management. Other clinical topics include: understanding blood transfusion reactions, congestive heart failure treatment to illustrate a multi-levels discipline of health workers dealing with one disease, essentials of phlebotomy, effects of serotonin and emotional balance, how to prevent medication errors and many more. This research started as an observational study beginning in 1977 to evaluate why patients were dying in hospitals due to errors. The process was more interested in the actual incidents and how they could have been prevented. The research study is divided into three parts. The first part of the study was published in the book Overcoming the Invisible Crime, which was designed as a pilot study to collect information on how medical errors occur. Since then, we learned a lesson that by describing the details of many medical errors, it not only aggravated some health care workers and managers, it did not influence a behavior change. So in May 1999, the second part of the study started to identify solutions and implement corrections to those problems. The third part is designed to measure the sensitivity of health care workers to medical errors. A few months after the second study started, the IOM report came out in December 1999. Our research is different from most conventional studies. This study is based on the identification of what works to solve the problems causing medical errors to occur. It was particularly not interested in numbers, since IOM already did that study. For example, if an "error of specimen collection" occurs because of mislabeled blood specimens sent to the lab, the important steps should be to identify why it happened, how can it be prevented in the future and how to implement corrective action. The wrong thing to do is spend three years to evaluate the rate of specimen collection errors in the ED and start fighting over the accuracy of the data as some institutions are presently doing. While the controversy continues, actions are not being implemented for corrections. In view of the past problems, the ongoing study focuses on reporting about solutions instead of discussing the problems or analyzing them. Many health workers, including some patients, volunteered to report cases of errors across the nation and what they were doing to fix problems. Many of the chapters of the book 101 Ways to Prevent Medical Errors are based on solutions which have worked in various hospitals. The team members are not supposed to reveal their project intention to the institutions lest the participants influence the outcome of the study. The third part of the study started in December 2001 to evaluate the interest of hospital CEOs and other health care workers in reducing medical errors. Here we are encountering shocking results. 1. Medical error is defined as action of a health care worker or a group of workers which lead to preventable harm, suffering or death of a patient in the process of treatment. 2. The above definition is the way most people look at medical errors, but the issues of errors based on this study go deeper than the above definition. Contrary to general notion, systemic problems are not the main cause of continuous errors, but rather the symptoms of bigger problems. Certain errors are made by workers who are well educated about procedures. These errors occur because of stress from inadequate staffing, anger and depression, lack of adequate rest, systemic problems or other distractions and deviations from normal protocols. Systemic problems are therefore not the only issue, but part of the problem. There is a major group of errors uncovered in this study due to lack of knowledge and adequate training of staffs about the procedures and lack of awareness of the implications of those errors. Patient and specimen misidentification errors are common errors to every level of health care with deadly results. 3. In this study, there are medical errors caused by action including: wrong diagnosis, wrong treatment, misadventure, medication errors, mislabeling of specimens, misidentification of patients, wrong lab results, wrong ED diagnosis from X-ray, surgical errors, blood transfusion errors, etc. Passive errors include inadequate treatment, like a case of low digoxin treatment of a heart failure patient which eventually led to death, because the substandard treatment was never well monitored. The same situation was uncovered in many patients who died of thrombotic stroke during anticoagulant therapy due to inadequate treatment. It is considered error of omission when the patient dies due to lack of treatment caused by delay or because the diagnosis is missed. This is also common due to failure to check glucose or oxygen level. Some of these errors are obvious in the ED, but not necessarily obvious for hospital in-patients. 4. There are errors caused by management of the disease process in both acute and chronic stages. Most of the chronic treatment errors are not obvious, because death is usually associated with the complications of the disease process. Some of these problems include: equipment failure, drug overdose and drug interactions, bad medications, toxicity of antibiotics, toxicity of unmonitored cancer therapy, wrong diagnosis causing unnecessary cancer chemotherapy leading to death, poorly managed disease, pharmacy errors, lab errors, lab's delay in reporting results, nurse's delay in responding to emergency situation, physician's delay in treating a patient, misreading and misinterpretation of medical reports, hospital in-house shortage of help leading to delay in response to emergency situations, etc. 5. 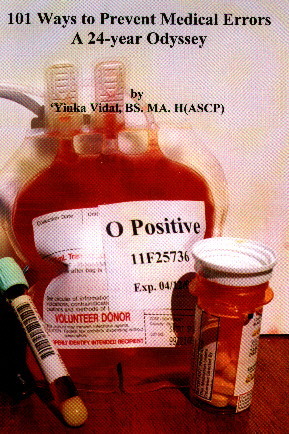 Deniable and concealable errors are observed in drug overdose, wrong choice of treatment, errors from surgical operation, overdose of anesthetic agents, wrong anesthetic agent, reactions to anesthetic agents, misdiagnosis, surgical infections, patient bleeding to death during surgery due to inadequate response to excessive bleeding, overdose of Heparin, etc. 6. This study was designed to find solutions more than investigate medical errors. Chapter Seven deals with various solutions, while Chapter Eight features the process of implementing solutions to identified problems using the nursing and laboratory departments. These are the largest and perhaps most important chapters in the book. It was during the process of working at this phase that the major problems in the continuation of medical errors were uncovered. 7. From our latest study conducted from December 2001 to January 2002 of 7,000 hospital CEOs, less than five percent placed medical errors on their priority list, but 95 percent placed hospital revenue on their priority list. A study is currently underway to test other health care professionals about their alertness to medical errors. Upon interviewing the White House spokesperson, Mercy Viana, about the public's concern regarding medical errors, she said, "President Bush is dedicated to affordable and reliable health care services and committed to signing the patient's bill of rights." We were also directed to the Department of Health and Human Services (HHS). After a brief interview, Nicole Guillemard of HHS forwarded some crucial information regarding government intervention with regard to medical errors. The report was issued by the HHS press office announcing a $72 million grant for the year 2002 to help reduce medical errors. According to the report, many programs are being put in place by HHS to help reduce patient deaths from preventable errors. Some of these efforts include: Center for Medicare & Medicaid Services (CMS) formerly HCFA monitoring the pattern of adverse events in hospitals; AHRQ's $50 million for research to identify "best practices" for reducing errors; FDA proposal for user-friendly drug labeling to reduce errors; QuIC task force working with the Institute of Healthcare Improvement to test strategies for reducing errors in high risk areas of the hospital such as ED, surgery and ICU; pilot projects being conducted by CMS aimed at improving patient safety; and patient education on medical errors. On February 2, 2002, Tommy G. Thompson, the secretary of HHS said, "President Bush's budget for fiscal year 2003 will propose $84 million for initiatives to reduce medical errors." The press report was released by AHRQ with new consumer tips on preventing medical errors. Despite all the programs being put in place by the government, the impact is not being felt at the patients' level three years after the IOM report. Perhaps the programs are still in infancy, and it may be too early to judge their effectiveness in reducing medical errors. AHRQ is also seeking more research proposals this year and will be issuing grants to health care and education institutions for such projects (www.ahrq.gov). Based on what we have uncovered with this ongoing study so far, the solution of correcting medical errors is not at the level of the identification of problems or the continuous analysis of root causes. The remedy is at the levels of designing solutions, implementing such solutions and measuring the outcome. This part of our study is unique, because it is targeted directly to those health care professionals working with patients. All those committees in different hospitals on medical errors must move past the analysis of problems to implementing solutions and measuring the outcome. No single problem is ever going to be solved by just the analysis of the data. Although many successes were reported by different project members across the nation, the greatest obstacle to medical error remains the human resistance and lack of desire to change. It is very surprising that human factor plays more roles in the continuation of medical errors than anticipated. Evidence also suggests that for effective behavior change to take place, incentives must be given to both health care workers and health care institutions as a form of motivation. Those hospital CEOs who have responded positively to the correction of medical errors must be complimented. While some hospitals are still fighting over the appropriateness of medical error data, or quality assurance indicators, this study takes the struggle to reduce medical errors beyond health care officials. Our study concludes that to directly impact immediate behavior change and to sustain continuous awareness about medical errors, the battle against errors must be taken directly to health care workers, medical schools and all others schools of allied health professions. In addition, as a society, we must reevaluate our relationship with money and power. We must ask ourselves the frank question of why we inadvertently operate a system as if we value money more than human life? If we can find solutions to this human tragedy, the biggest battle of medical error is won. Join our national team and campaign to reduce medical errors.